Departing the Text: Common Core Standards and Changes: What are they and what's the fuss? Common Core Standards and Changes: What are they and what's the fuss? With schools gearing up the 2012-2013 academic year, I decided to devote "C" week at ABCWednesday to curriculum issues and Common Core Standards. If you're a home-schooling parent, a teacher, publisher, school librarian, or simply a parent involved in your kid's education, my bet is that you've heard of common core standards, and IF by some chance you haven't...you will...more and more as common core standards are the latest buzz effecting publishing and educational decisions across the country. Many politicians, parents, publishers, and educators approve of these standards as they help guide curriculum, making it easier to write and sell educational products across the country. And, in theory, they should be guiding classroom readings, labs, and curricular goals so that, to borrow a phrase, no child gets left behind. Its critics, however, fear that these standards will lead to more and more testing to make sure such standards are met, and may cause many school boards which may have recently spend a great deal of money investing in text books to have to reinvest again at a time when school boards are extremely strapped for cash. To date, all states but Texas, Alaska, Virginia, Minnesota, and Nebraska have signed onto following the Core standards for math and English language arts; many in part in order to compete for the $5billion in Race to the Top funds from the U.S. Department of Education (which was won by 11 states, plus the District of Columbia and is now closed). In theory, the Core authors want students to think more critically about what they're reading - be it in language arts, science, or history/social studies. Furthermore, each content area subject has guidelines for curricular study, for speaking, listening, and reading as well as for writing. Across the board, instead of just summarizing, teachers are directed to have students employ, evaluate, and compare multiple sources in multiple formats and to give more sourced evidence supporting their opinions. There is also an emphasis of having students (in language arts) read non-fiction equally or more than fiction. ...as noted in the standard's criteria for publishers, scientific and historical texts should receive the "same time and weight as literary text." By the 2014-15 academic year, the initiative calls for 50% informational text (including textbooks, essays, speeches, newspaper articles, and nonfiction trade books) in elementary school and 70% in high school - on average, across all curricula...David Coleman, a lead writer of the Core's English language arts plan. [notes that].."The celebration of nonfiction's role is not meant to be at the expense of fiction." The nonfiction-to-fiction ratio currently being taught in schools nationwide is unknown, but Coleman says the new split is based on the ration found in the National Assessment of Educational Progress test. While many may be put-off by the 50-50 split of fiction/non-fiction, I have no problem with it as there some absolutely fantastic "non-fiction" books that read more like fiction than the "non-fiction" I grew up with. AND, graphic novels can play a huge role in making the non-fiction come to life while addressing the goal that "teachers are directed to have students compare multiple sources in multiple formats and to give more sourced evidence supporting personal opinions." 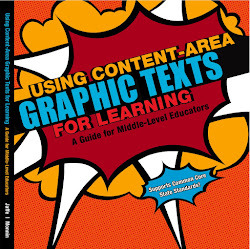 Furthermore, Appendix B notes that "visual elements are particularly important in texts for the youngest students and in many informational texts for readers of all ages." Laika by Nick Abadzis (Grade 4+) is a graphic novel about Laika and her owners/care takers and relates the space race from the Soviet perspective. I highly recommend reading this and then reading Homer Hickham's October Sky (the story of the 1950's space race from an American boy's perspective). Lewis and Clark by Nick Bertozzi (Grades 4+) a non-fiction graphic novel and visual/verbal gem recounting how the expedition was organized and the perils its members faced. Northwest Passage by Scott Chantler (Grades 4+) a non-fiction graphic novel that relays this pivotal story in American history(with author annotation to help those novice visual readers AND provides additional reading suggestions and historical details. Feynman by Jim Ottaviani and Leland Myrick (Grades 8+) graphic novel - relates Nobel winning physicist Richard Feynman's life from childhood, his work on the Manhattan Project, his exposure of the Challenger disaster, his work on quantum electrodynamics, and his antics in art and music. Marathon by Boaz Yakin & Joe Infurnari (Grades 7+) is the story of a Eucles, an Athenian messenger who in 49 ran over 300 miles to save Ancient Greece from being subjugated into the Persian Empire. This marathon runner was the turning point in ancient history, and the foundation of the modern Olympic Games. SUPER read - especially now. Journey into Mohawk Country by George O'Connor (Grades 5+) tells the story of Harmen Meyndertsz van den Bogaert who at age 23, ventured into Mohawk territory with guides, maps and some food, trekking through freezing temperatures, to revive the struggling fur trade. The United States Constitution: A Graphic Adaptation by Jonathan Hennessey and Aaron McConnell (Grades 6+) is one of the BEST books I've ever read dealing with our Constitution. It describes the precipitating factors and events that led to our Nation's birth and clearly and succinctly details our Constitution's preamble and twenty-seven Amendments. author uses exceptional prose, vocabulary and a great dollop of alliteration as he describes the adult life of this female carnivorous giant. Readers are not only exposed to etymology, vocabulary and literary devices, they learn about the lives of sharks, sea turtles, seals, dolphins, whales, ecology, pollution, the "Great pacific Garbage Patch" and much more. Farewell to Manzanar by Jeanne Wakatsuki Houston and James D. Houston (Grades 5+) prose text - a true story of a Japanese-American family sent to an internment camp near San Pedro California during World War II. This is a riveting, thought-provoking and heart-wrenching story of prejudice, hate, and fear. Remnants of the camp remain and are now a national park - well worth a visit after reading the book. October Sky by Homer Hickham tells the story of the 1950's space race from an American boy's perspective. The Notorious Benedict Arnold: A True Story of Adventure, Heroism & Treachery by Steve Sheinkin (Grades 5+) - the author tells this swashbuckling story of Benedict Arnold's life in chronological order with tension and excitement and includes several maps to help visualize this history and critical battles. Into the Unknown: How Great Explorers Found Their Way by Land, Sea, and Air by Stewart Ross and illustrations by Stephen Biesty (Grades 3+) in engaging chapters with stunning art Ross and Biesty relay the brave adventures of Leif Eriksson, Marco Polo, Ferdinand Magellan, Captain Cook, Pytheas the Greek and more. How Much is A Million - by David M. Schwartz, illustrated by Steven Kellogg (Grades 1+) relays mind boggling images to show kids just how much a million is. Island: A Story of the Galapagos by Jason Chin (Grade 2+) - a picture book whose words and illustrations beautifully depict the story of these islands and their inhabitants - from their birth six million years ago, to 1895 where little remains above water. Barnum's Bones: How Barnum Brown Discovered the Most Famous Dinosaur in the World by Tracey Fern; illustrated by Boris Kulikov (Grades K+) - tells Barnum's story from childhood to his hunting for dinosaurs for the American Museum of Natural History, discovering one (a T-Rex) in 1902 and how he dug and fit the bones together. Bird Talk: What Birds are Saying and Why by Lita Judge (Grades 1-4) nicely fits in to science and natural history curricula and science discovery as it talks about the different ways birds communicate (song, dance and drum, cuddle, flight) and what they mean. Life in the Ocean: The Story of Oceanographer Sylvia Earle by Claire A. Nivola (Grade K-3) is a short biography of Sylvia Earle, a pioneer and entrepreneur in her filed. The stunning watercolors and straightforward narrative highlight Earle's career and love for the ocean and its exploration. Lincoln's Last Days - by Bill O'Reilly (Grades 5+) which will be out in late August and is a graphic text written in prose with maps, photos and illustrations. I have a post coming out very soon about this one! Zero the Hero by Tom Lichtenheld (Grades 1-5) is all about math, roman numerals, and the value of zero. The Plant Hunters: True-Stories of Their Daring Adventures to the Far Corners of the Earth - by Anita Silvey - (Grades 3-7) depicts the risks (tigers, fever, murder and more) eighteenth and nineteenth century explorers and scientists faced in their search for new and unusual plants. Citizen Scientists by Loree Griffin Burns (Grades 3-7) - graphic text - This 'activity' book is divided into seasonal sections, inviting readers to participate in actual science experiments. The photos/illustrations, and the layout and graphics are inviting. There is a field guide in each section as well as a resource section. Paiute Princess by Deborah Kogan Ray (Grades 3+) - using original sources, the author tells of about the life of Sara Winnemucca (grand-daughter of Chief Truckee) and how American Indians of Nevada, the Paiute Kuyuidika-a band coped with the expanding railroad and ranchers squeezing the Paiutes' living space and ability to survive. To the Mountaintop: My Journey Through the Civil Rights Movement by Charlayne Hunter-Gault (Grades 7+) about one of the first two students to successfully desegregate an all-white college in the South. In addition to her own story, she includes background history of court rulings pertinent to the story and each chapter begins with reproductions of partial pages from The New York Times to help tell the story. From the Good Mountain: How Gutenberg Changed the World by James Rumford (Grades k-3) - this book tells the story of Gutenberg and his press, and how books are made/assembled through stunning art, riddles, and questions and answers. Publishers say how toilets work will be next!!!! In my opinion, the idea of standards is a good one and I support the idea of critical listening, speaking, reading and writing. The problem is, that the most effective learning is when its personal and meaningful to students, and, what is meaningful changes based on backgrounds, personalities and cultural exposure and preferences. There is also the issue of testing, over testing, and districts teaching only for testing. As noted in The Pirates of the Caribbean these standards should be more like guidelines. FOR EVEN MORE... AND FOR ALL INTERESTED...I have another post "HE## YES!!! GRAPHIC NOVELS MEET COMMON CORE STANDARDS: HERE'S WHY AND A LIST OF MY FAVORITES"
One final note before closing: Selecting graphic novels can be difficult as many of those mentioned above are not on book store shelves. Most of the graphic novels above are from First Second and ONI who publish quality kids graphic novels and are the the first places I tend to check for great quality kids' reads. Please let me know what you think! In the meantime, thanks for your visit, your support, and your comments. Thanks for your visit and have a great week! Great and interesting reading list! As someone on the other end - the university, teaching future teachers science - I find that a huge problem is that the teachers are not prepared to deliver the material. If the teachers don't fundamentally understand a concept, how can they teach it? The constant changes in the testing standards is a bit of a scam, though. It's just money for the textbook industry. It's not good for the students. In many European countries, textbooks are a tiny fraction of the size of US textbooks and all the material is covered. They're also less expensive. Perhaps we should start really looking at how to condense relevant information rather than rewrite standards and force schools to buy expensive textbooks. I'd also be interested in how US education's "bang for the buck" measure against European and other nations. We know we spend more on healthcare and get less quality. Maybe it's the same in education. Thanks for sharing this info with us at Trivium Tuesdays! I see, too, the good intent behind this, but see how it will probably just become more government control and lead to children not learning (unfortunately). I've heard good things about those David Macaulay books! Texas, I suspect, is not on the list because they publish their own bizarro textbooks. I suppose core curricula make sense, but it's made school less fun - for me as a parent of a soon-to-be 3rd grader. I confess that when I just read "gearing up the 2012-2013 academic year" I got the same feeling I'd get 40 years ago when the summer was only half over and the sales were already starting. My story this week is called Culmen ’79 but you already know that because you just visited. Wow, what an informative and interesting read. I have 11 grandchildren from 26 to 3...they are all going to be effected by this. Thanks for giving me some insights. This is an awesome post which provides a lot of information that I will be happy to refer back to, especially with my daughter in law being a teacher. Thank you for this information, Meryl! I must confess that I've never heard of Common Core Standards! Does this mean that teachers must all work according this system? Is there still place for improvisation? I suppose that schoolbooks are different in various states as they represent the environment of the children and older students. I don't know how the system is in my country now, as I don't teach any more. When I did, I was happy to be able to use my fantasy. Thanks for your visit and comment! Have a great week! Very informative. love the book list although my daughter is still in grade school, going to use it as a reference. I'll have to come back to this post when my sons are a little older. I bet cursive has been knocked out of the common core standards. I keep hearing about schools taking it out of their classrooms. Great info. on Core Standards and an excellent summer reading list for my son James who is going into the 5th grade! Thanks! That looks a reading list to stir the imagination. The Lewis and Clark cover certainly would appeal to any child dreaming of adventure. What a great collection of books. I am going to have to get a few of these. Yesterday was our first day back to school for teachers. Guess what we talked about during inservice? Yep. Common Core standards! Great reading lists! I am heartened to see someone working to introduce and implement Graphic Novels! This is the first I've heard of it, but this is some great info. Last year my daughter's high school (in NH)actually got rid of midterm exams, much to the delight of the students, but not so much for the parent's. We'll see what changes will be made this year. Writing school papers on mandatory summer reading books might not have been so painful if some of those graphic novels had been included! Great recommendations. Thanks for stopping by Welcome Wednesday! Thanks for the reading link! I have a niece that can greatly benefit from this during her last month of summer. Now I'm glad I came across this blog from the wordless wednesday link up. I, for one, am in favor of a common core. But, not for excessive testing. Haven been in higher ed for many years, I see the need for it-even more so with the 2 year colleges and the 4 yea colleges so that there is some level of consistency in transfer practices. If the Greeks succeeded at doing this so many years ago, surely we can't? oops-sorry for the typos! A kitten over my shoulder distracted me. Thanks for sharing the valuable information. I'm following you from the Thursday Blog Hop. This is another helpful information for us parents! Catching up with ABC. Thanks for the list! These look like some great reads for my kids! I don't know that how to use these apps. Can you give me some suggestion through by your post. Thanks.